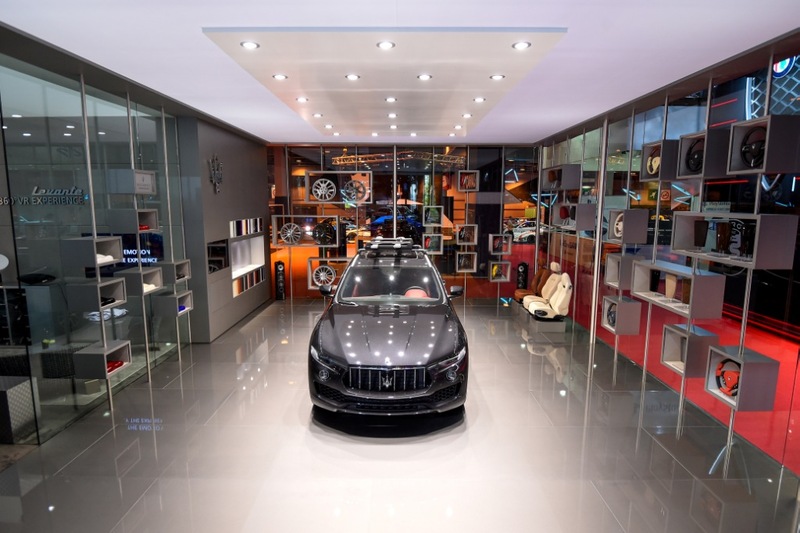 Modena, Italy, September 29, 2016: Maserati is taking its entire range to the Paris Motor Show 2016 with some important updates. The MY17 saloons remain faithful to their heritage while offering unmistakable class, top-quality performance and a thrilling yet comfortable driving experience which means a more desirable premium saloon than ever before. After three and a half years of unprecedented international success, the Quattroporte has undergone a substantial restyling that accentuates its elegance without altering its signature Maserati personality. The restyled Quattroporte, available since June 2016, represents the quintessence of Italian sport saloons and is destined to continue a success story that started in 2013. 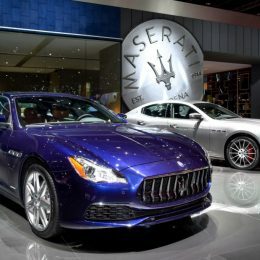 The exterior of the restyled Quattroporte is recognizable with a new bumper design with matte black profile at the front and the matte black extractor at the rear. The front grille is sharper and more imposing, and it introduces new vertical chrome elements which contrast with the depth of the shark-nose effect. Other distinguishing details of the new Quattroporte are the matte black side skirts and the wing mirrors, which have been slightly restyled to incorporate new technology. An electrically adjustable Air Shutter has been fitted in the front grille between the air vents and the engine’s radiator. The Air Shutter provides optimal control of the engine’s coolant temperature and, together with the optimization of the new front and rear bumpers, air conveyor and flat bottom, reduces drag by 10%. This area is now characterized by a continuous technical element which incorporates the screen, new climate control system, and new compartment in a single seamless design, emphasizing the pure, elegant layout typical of the Quattroporte. The lower part of the central console has also been redesigned and now features a rotary knob for volume and function control, a new lid and phone storage compartment. The stylistic approach to these functional elements permits a minimalist design approach for the centre of the dashboard. 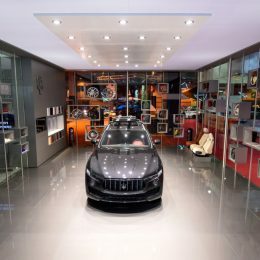 From the beginning Maserati has represented the perfect blend of luxury and sportiness thanks to its race-bred engineering. 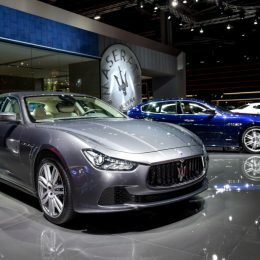 With the restyling of its flagship Quattroporte, Maserati is launching a new range strategy to offer its demanding clientele the additional choice of two unique trim options which emphasize the two key pillars of the brand’s DNA: GranLusso and GranSport. These two highly distinctive trims are available as an upgrade for all Quattroporte V6 versions (Quattroporte Diesel, Quattroporte, Quattroporte S, Quattroporte S Q4). Both trims will be priced at the same level across the range. 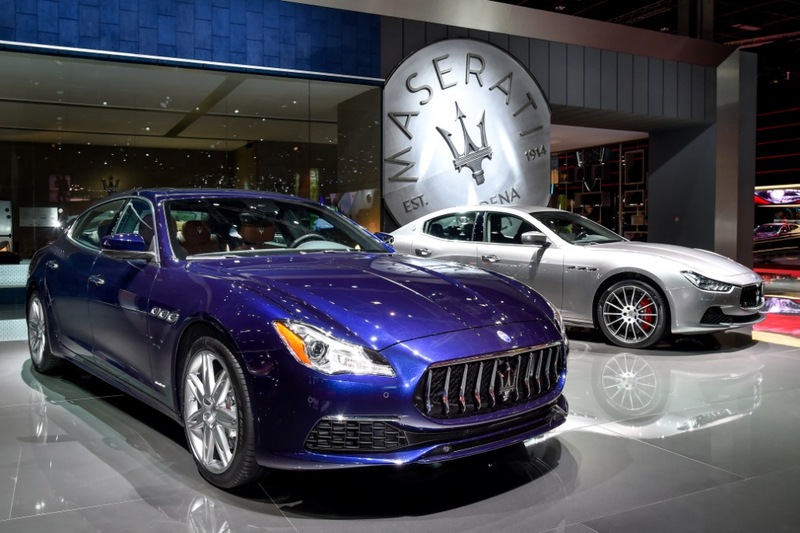 The top-of-the-range version, the Quattroporte GTS, which features the twin-turbo V8, will be available exclusively with either the GranLusso or GranSport trims as standard. Each trim level has been designed to meet the needs of customers seeking a distinctive and unique product in the executive saloon segment. 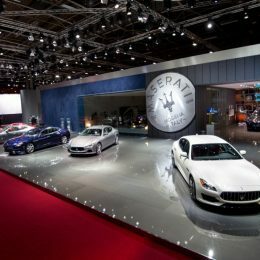 GranLusso and GranSport are immediately recognizable thanks to their distinct exterior lines and unique interiors. The GranLusso trim reinterprets the concept of luxury in a race-bred luxury saloon by enhancing the exterior finish and improving in-cabin comfort for driver and passengers. It offers a higher level of luxury using exclusive materials and special features in the finest tradition of Italian craftsmanship. GranLusso stands out with its new front lower fascia design with an elegant floating bridge element and a delicate spoiler, trimmed with chrome bumper finish and body colour bumper profiles. The profile incorporates side skirts, while on the rear the look is even cleaner, featuring a sculpted retroreflector and a body coloured spoiler; the exterior look is capped off with 20” Mercurio rims and black brake calipers. Inside, the soul of the GranLusso is epitomized by the Ermenegildo Zegna Edition interior that features a patented silk fabric, an industry first, on the seats, doors, headliner and sun visors; the seat upholstery details and the label behind the sun visors make this version unique and exclusive. The interior ambience is further refined thanks to the luxurious Radica wood dashboard and the leather steering wheel with wooden inserts. The trim incorporates comfort-oriented equipment like power foot pedals, electric rear sunblind, four-zone air conditioning, heated rear seats and extended keyless entry. The GranSport trim underscores the sporty character of the Quattroporte by enhancing the aggressive appearance of the car, with new exterior design cues and interior content which reflect the legendary racing heritage of the Maserati brand. On the front of the Quattroporte GranSport, the dedicated restyling for the centre and side air intakes improves cooling while showcasing an aggressive front end. The lower fascia is linked to the grille with aerodynamic inspired splits. The back features a composition between the centre fuselage and two side pockets which really stands out and draws attention to the exhausts. An aggressive Black Piano spoiler completes the rear view. The Quattroporte GranSport is fitted with 21” Titano rims and features a glossy black finish on the bumpers, red brake calipers and blue inserts in the front Trident and side Saetta badge, as well as blue Tridents at the centre of the wheels. As an option, the front grille of the GranSport can be ordered in a gloss black finish. The interior of the Quattroporte GranSport includes redesigned front and rear seats, with sculptured profiles, to improve sports driving performance, while a new sports steering wheel, in carbon fibre or full leather, creates a strong identity. Thanks to the high-gloss Black Piano wood trim on the dashboard, the brand new sport seats, the sport steering wheel with aluminium shift paddles, and the stainless steel sport pedals, the interior of the Quattroporte GranSport ensures a truly sporty experience. A further opportunity for customization is available in the form of the optional Exterior Carbon Pack for the GranSport trim, to further enhance the sporty exterior. This pack features wing mirrors, door handles and B-pillar cover, plus the profile of the front bumper, in carbon fibre. Engine-wise, the Quattroporte remains faithful to its traditions with a very wide range of powertrain options, starting with the Quattroporte GTS, powered by the immense 530 hp 3.8 litre Ferrari-produced V8 Twin-Turbo with rear wheel drive, capable of a peak torque of 710 Nm with a top speed of310 km/h, accelerating from 0 to 100 km/h in just 4.7 seconds. The Quattroporte is also available with the 410 hp 3.0 litre Ferrari-produced V6 Twin-Turbo, with rear wheel drive (Quattroporte S) or with Q4, the intelligent all-wheel-drive system available with the Quattroporte S Q4. Both versions offer 550 Nm of torque and a 286 km/h top speed, with the S Q4 variant accelerating from 0-100 km/h in 4.9 seconds and the rear-wheel drive Quattroporte S version in 5.1 seconds. Based on the same V6 architecture, the Quattroporte is also available in certain markets with 350 hp, 20 hp more than in the previous version, capable of delivering a powerful drive with torque of 500 Nm, acceleration from 0 to 100 km/h in 5.5 seconds and a faster top speed of 270 km/h. The range is completed by the Quattroporte Diesel; featuring a 3.0-litre V6 Turbo, it delivers 600 Nm of torque with 275 hp, retaining a top speed of 252 km/h and an impressive 0-100 km/h time of just 6.4 seconds. 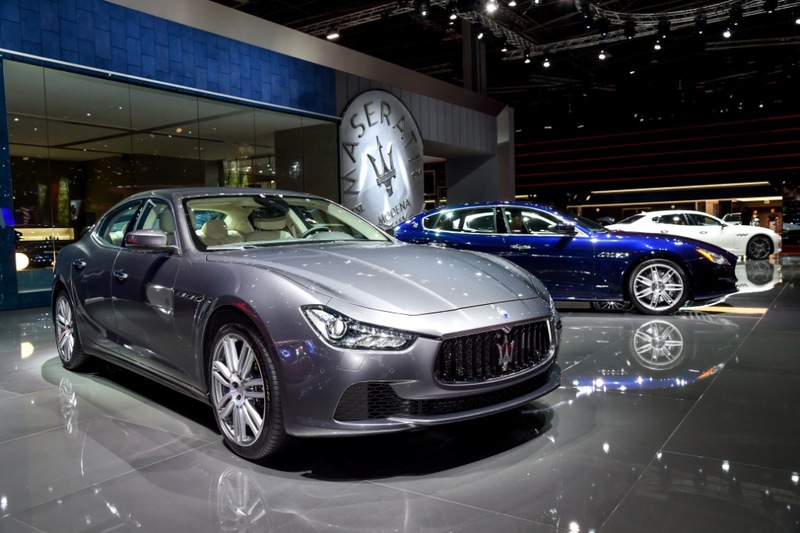 For the MY17 upgrade the Maserati Ghibli range remains faithful to its heritage while offering unmistakable class, top-quality performance and a thrilling yet comfortable driving experience in a premium saloon which is more desirable than ever before. The MY17 Ghibli benefits from interior upgrades as well. The central dashboard has been redesigned to accommodate a high resolution 8.4” multi touch screen. The new infotainment system is compatible with both Apple CarPlay and Android Auto smartphone mirroring functions. The lower central console has also been redesigned, and now features a rotary knob to control the volume and functions, a new lid, and a new phone storage compartment. All versions of the Ghibli are now equipped with an Air Quality Sensor, a feature which substantially improves passenger comfort. This system combines an intelligent sensor and a signal analysis system which determines the external pollution levels and prevents polluted air and toxic gases from entering the cabin. A new package of Advanced Driver Assistance Systems (ADAS) is available as an option. It includes Adaptive Cruise Control with Stop & Go, Blind Spot Alert, Lane Departure Warning, Forward Collision Warning with Advanced Brake Assist and Automated Emergency Braking. An additional Surround View Camera is available as an option in combination with the ADAS package. The Ghibli S, with its power output of 410 hp, accelerates from 0-100 km/h in 5.0 seconds and reaches a top speed of 285 km/h. The Ghibli S is also available with the Q4 All Wheel Drive system. The Ghibli S Q4 accelerates from 0-100 km/h in just 4.8 seconds, up to a top speed of 284 km/h. The Ghibli Diesel with its Euro 6, 3.0-litre V6 engine, exclusively developed by Maserati together with VM Motori, generates 275 hp, amongst the best in its class. 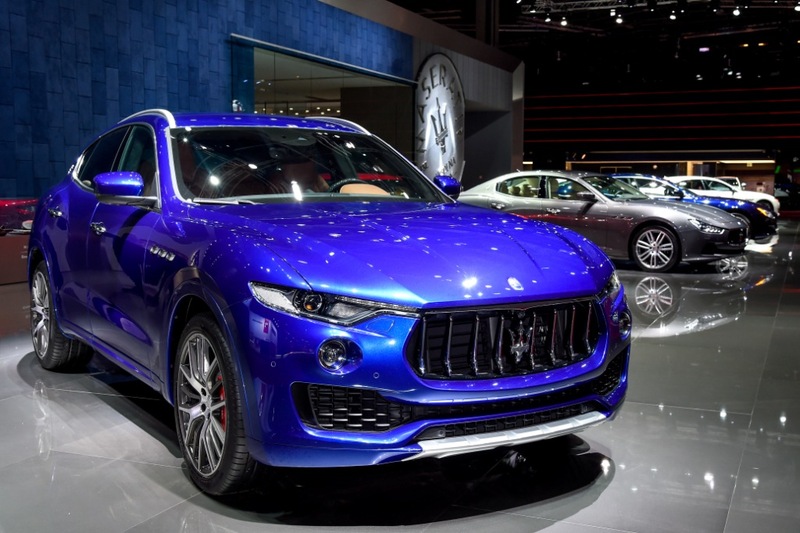 Levante, Maserati’s first SUV, with its distinctively Italian style and breathtaking iconic Maserati design features, continues to generate acclaim. Design, exclusivity and performance are the key characteristics for describing this new Maserati. On the stand a Levante S and a Levante Diesel steal the show. 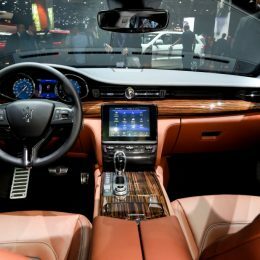 The interior of each Levante has been created with the finest materials, from optional premium leather to Ermenegildo Zegna silk, made with a patented process by the Zegna woolen mill in Trivero. The spaciousness of the interior, enhanced by the panoramic electric sunroof, is combined with coupé-sleek exterior lines and the best aerodynamic efficiency in its category, with a drag coefficient of just 0.31. The technology incorporated in every Levante is designed to offer outstanding performance both on- and off-road. Sophisticated suspension – double-wishbone on the front axle and multi-link on the rear – combined with electronically controlled damping, four corner air-springs providing five dynamic ride levels (plus one additional park-position), all play an essential role in the car’s handling. Furthermore, with the lowest centre of gravity in its class, perfectly balanced weight distribution (50-50) between front and rear, high levels of dynamic torsional and flexural rigidity, and a mechanical self-locking rear differential as standard, when driven on-road the Levante delivers all the performance and excitement typical of any Maserati. The body height adjustment is particularly useful for off-road driving, guaranteeing ride comfort at the top of the category; when set to the minimum ground clearance, it enables the car to perform at its sporty best. The Levante is powered by a 3.0 litre V6 Twin-Turbo petrol engine generating 350 hp or 430 hp, or a 275 hp 3.0 litre V6 Turbo Diesel. All engines are combined with the “Q4” intelligent all-wheel drive system – which can transfer torque between the axles instantaneously when required – and an 8-speed automatic gearbox, with integrated Start&Stop System. In terms of performance, the Levante S (430hp) covers 0-100 km/h in 5.2 seconds, has a top speed of 264 km/h, and provides combined NEDC-cycle fuel consumption and emissions figures of 10.9 l/100 km and 253g CO2/km respectively. 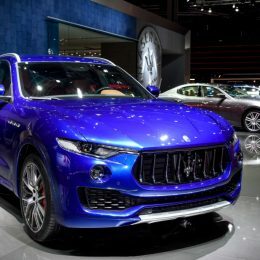 The Levante (350 hp) accelerates from 0 to 100 km/h in 6.0 seconds and achieves a top speed of 251 km/h, with combined cycle fuel consumption and emissions figures of 10.7 l/100 km and 249g CO2/km respectively. The Diesel-powered Levante (275hp) covers 0-100 km/h in 6.9 seconds, and has a top speed of 230 km/h, while its combined cycle consumption and emission figures are 7.2 l/100 km and 189 g CO2/km respectively. 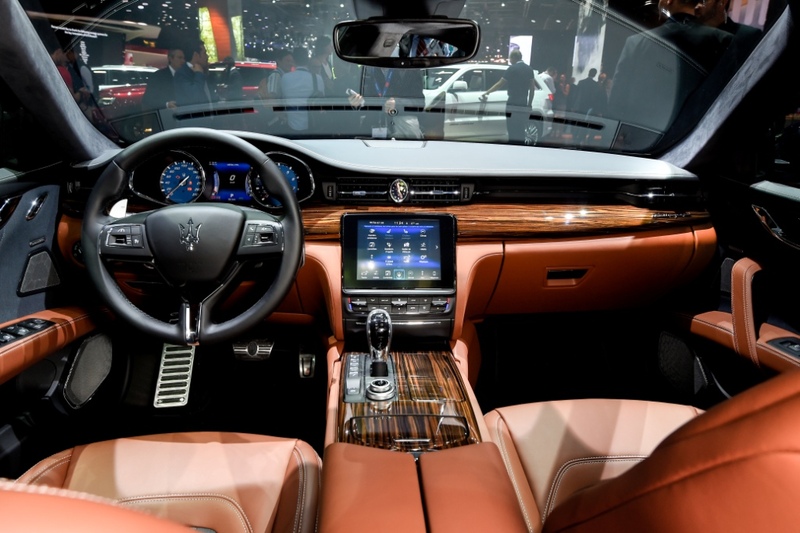 The human-machine interface on board is based on an evolution of the Maserati Touch Control system, completely updated to offer even more functionality and convenience: the 8.4” high-resolution screen is capacitive, and can – in addition to the touch system – be operated using the new rotary control on the central console. A wide range of sophisticated advanced driver assistance systems is available, including Adaptive Cruise Control with Automatic Start&Stop function, Forward Collision Warning, Advanced Brake Assist and Lane Departure Warning. Further options include Blind Spot Alert, Surround View Camera with front and rear dynamic lines, and a powerlift tailgate. The sports car range is represented on the stand by the GranTurismo MC Stradale. The engine in the GranTurismo MC Stradale is the Euro 6-compliant 4.7 litre 460 horsepower naturally aspirated petrol 90° V8, featuring a rear-wheel drive system with the gearbox coupled to the rear differential, enabling the car to accelerate from 0-100 km/h in just 4.5 seconds; the top speed is 303 km/h and the car has Brembo carbon-ceramic brakes. 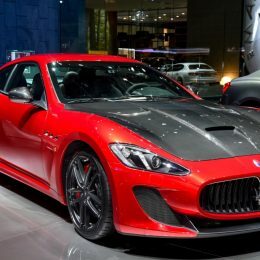 Apart from the MC Stradale on display, the sports car range includes the GranTurismo, with a 4.2 litre, 405 horsepower naturally aspirated V8 petrol engine and 6-speed automatic transmission, and the GranTurismo Sport, powered by the same 4.7 litre 460 horsepower naturally aspirated V8 petrol unit as the MC Stradale, available with MC Auto-Shift automatic transmission or MC Shift robotic gearbox, all with rear-wheel drive. 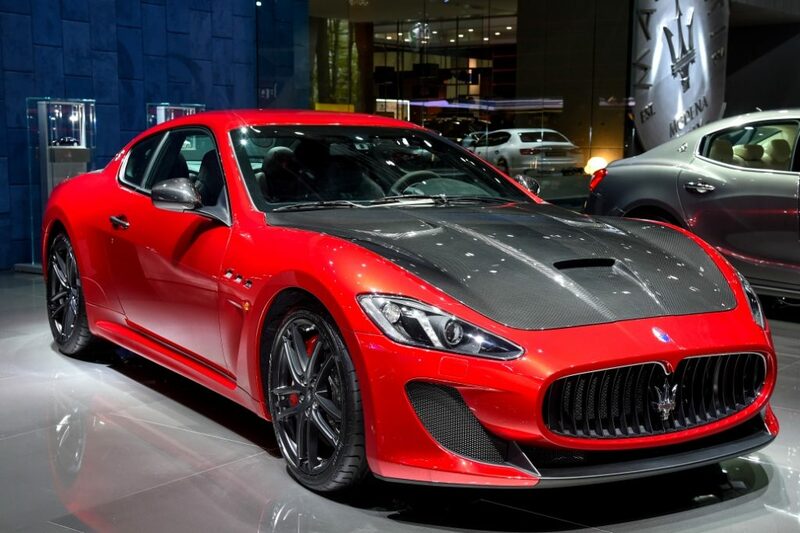 The Maserati GranTurismo combines exceptional performance with pure Italian design by Pininfarina; created as the ultimate in the GT sector, it features sleek, attractive lines and a style which harks back to the elegant 1947 Maserati A6 1500GT, the car that spawned the GT segment. Its long front, muscular rear and defined lines suggest forceful forward motion – even at a standstill. Particular attention has been paid to precise adjustment of its lines to perfect the aerodynamics. With a very roomy interior designed to provide spacious accommodation for up to four adults, it offers unrivalled comfort for daily trips and long journeys alike, and also requires remarkably little effort from the driver even as performance is pushed to its impressive limits. The elegant and sumptuous hand-crafted interior blends luxury and space with performance in perfect harmony, highlighting the GranTurismo’s sporting character without sacrificing usability. 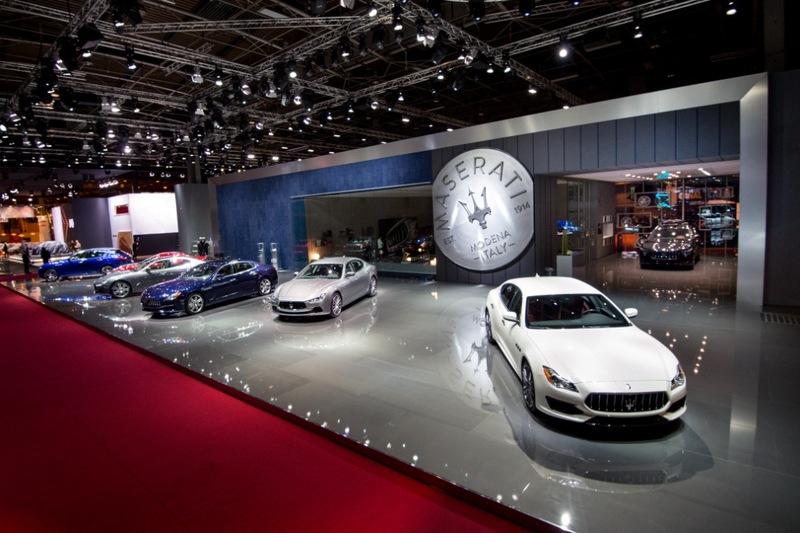 Maserati also offers an unrivalled customization programme, enabling every customer to “create” their own GranTurismo. The Maserati sports-car family also includes the GranCabrio, with its powerful 4.7 litre Euro 6 naturally aspirated 90° V8 petrol engine with automatic 6-speed gearbox and rear-wheel drive; its 460 horsepower output provides exhilarating performance, powering from 0-100 km/h in 5 seconds and reaching a top speed of 285 km/h. The Maserati convertible range is completed by the 450 horsepower GranCabrio and the 460 horsepower GranCabrio MC, both with a 4.7 litre naturally aspirated 90° V8 Euro 6 petrol engine, rear-wheel drive and 6-speed automatic transmission. The Maserati GranCabrio is a sporty convertible designed for GT use, accommodating four adults in comfort and with a distinctive style and strong personality. The unmistakable lines designed by Pininfarina, which has imbued generations of Maseratis with unmatched beauty, are reflected in the timeless tradition of the GranCabrio, designed to prioritise unbeatable comfort even on long journeys, driving pleasure, and elegance. Its streamlined shape, combined with impeccable aerodynamics, are the result of painstaking attention to the smallest detail, while the memorable lines pay homage to the glory of the brand’s one hundred years of history, the quintessential expression of Maserati’s heritage. The soft-top of the GranCabrio range, available in eight different colours, consists of three layers of coated canvas on a steel and aluminium frame, guaranteeing quiet, draught-free driving. The GranCabrio range offers on-road luxury with its spacious interior featuring four comfortable individual seats in leather – Poltrona Frau Leather or drilled Alcantara depending on the variant – perfect ergonomics, and easy-to-use interfaces.